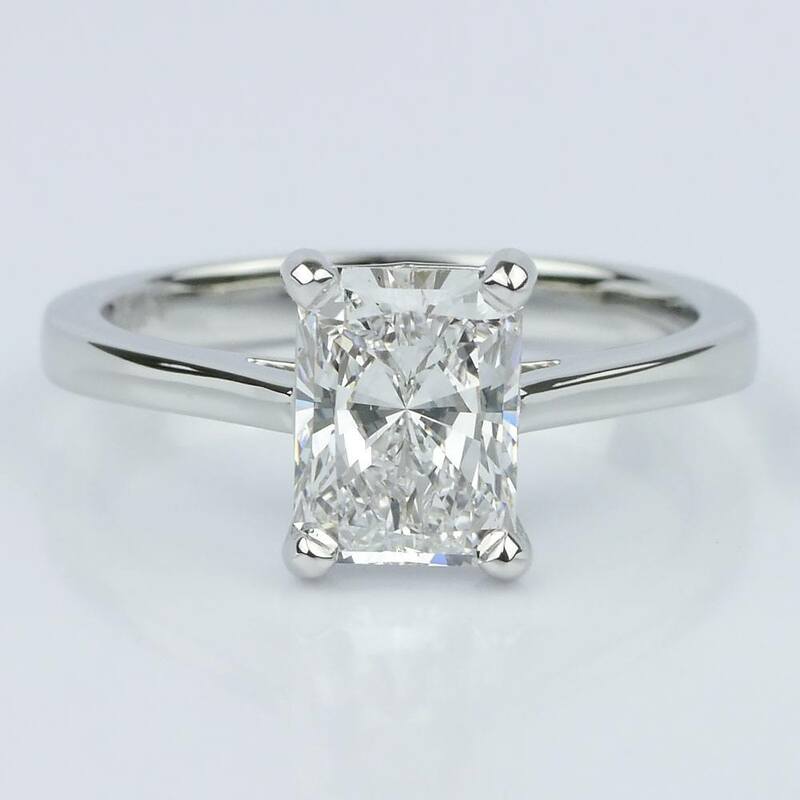 The perfect marriage between the bright spark of a round brilliant diamond and the sleek elegance of an emerald cut diamond creates the dazzling yet chicly refined radiant cut. Radiant diamonds live up to the legacy of their name. Equal parts sparkling fire and demure elegance, the radiant cut remains the diamond shape of choice for the bride who wants refined beauty without sacrificing the brilliance of a round or princess cut. The popularity of the radiant cut is a newer trend—as is the cut itself. Radiant cuts were first created about 20 years ago, and the shape’s hybrid perfection represents the optimism and astonishing prosperity defined by the late 90’s and the turn of the new millennium. Radiant diamonds allow the wearer to have it all in one beautiful package. The cut—while raging with sparkling fire—also features the architecturally smooth lines of vintage cut stones like the emerald cut and the Art Deco designed Asscher cut. Like round brilliant cut stones—which offer the most shine and spark—the radiant cut may stand alone in settings or it may be paired with more dazzling designs. With radiant diamonds, wearers may choose to accentuate the cut’s fire as a solitaire or create even more brilliance by adding more diamonds to the setting. 1. The white-gold pavé diamond halo setting. The reflective quality of light-colored metal acts as a mirror for the spark of the radiant diamond. Add a beautiful and brilliant halo of pavé round diamonds for a remarkable fire. The hand will be bathed in light and the world will take notice. Check out this Pavé Halo Engagement Ring in White Gold that you can set with the diamond of your choice. As the radiant diamond offers a beautiful sparkle when set alone, a solitaire setting allows the diamond to speak for itself. Choose lighter metals to highlight the dancing sparkle. Or choose rose gold for a softer feminine touch. Pair the radiant cut with a line of u-prong round brilliant diamonds. The u-prong setting allows the side stones to hug the side of the radiant center stone for a magnificent effect. For maximum wow factor, set four or five round diamonds along each side of the center stone. The U-Prong Diamond Engagement Ring in White Gold is the perfect match for the radiant cut diamond. 4. Baguette side stone setting. Baguette cut diamonds offer an Art Deco appeal to engagement settings. Set alongside the radiant center stone, the baguettes create a ring that offers a beautiful, vintage look reminiscent of the roaring ‘20s. The dark blue hue of the pavé sapphires set off the fire of the radiant center stone and magnifies the cut’s spark. For maximum brilliance, choose a white metal. Platinum and white gold provide a neutral background for the intensity of the sapphire’s deep color. 6. Cross split shank solitaire. Add more intrigue to a solitaire setting by choosing a split shank band. The band features a criss-cross split shank design that provides a modern twist to a classic style. With the criss-cross design, the eye is pulled to the radiant center stone. This unique setting allows the radiant cut to pop and display its brilliance. Radiant cut diamonds are the perfect hybrid design. Offering the sparkle of the round brilliant cut and the sleek sophistication of the emerald cut, radiant diamonds shine beautifully alone or when paired with side stones or more intricate setting designs. Selecting a radiant cut means choosing a diamond that is the result of a perfect marriage of elegance and fire.